A mixed bag is the best cliché we can come up with to describe the year most U.S. and Canadian food and beverage manufacturers have had. That label probably applies to every year, but every year also has a few constants. Tyson and Boston Beer Co. can always be counted on to grow sales. Fiscal conservatives TreeHouse Foods and Cal-Maine Foods will turn in small but dependable annual profits. Sales at PepsiCo and Chobani plateaued three years ago. Post Holdings will remain awash in red ink, the result of another buying spree. All those presumptions are wrong this year … except for the red ink at Post. But after losses of $115 million in 2015 and $359 million the year before, a 2016 shortfall of “only” $3 million sounds like a turnaround for Post. Despite that huge Hillshire Brands acquisition in 2014 (which caused quite a sales bump in last year’s list) Tyson’s sales are down nearly 10 percent in the company’s fiscal 2016 (which ended Oct. 1 of last year). FY2015, however, was a 53-week year for the company. On the other hand, net income in FY16 skyrocketed 45 percent. “Sales decreased 11 percent in fiscal 2016 over fiscal 2015, primarily due to declining beef prices, the impact of an additional week in fiscal 2015 and the sale of our Brazil and Mexico chicken production operations,” Tyson explained in its annual report. At least the top-line number should be helped in next year’s chart (this fiscal year) by the recent acquisition of AdvancePierre Foods. By the way, AdvancePierre and WhiteWave Foods, both 2017 acquisitions (the latter acquired by Danone), remain on this table for the last time – this table being our annual list of the 100 largest food & beverage processors in the U.S. and Canada. Boston Beer, the maker of Samuel Adams and recently the acquirer of a number of emerging brands, recorded its first sales drop in at least five years, slipping back below $1 billion. “In 2016, the number of independent brewers passed the 5,000 threshold for the first time in history. As we have said often, this is the greatest time ever to be a beer lover. It’s also the most competitive time to be a brewer, as the size and structure of the beer industry continue to change,” the company’s annual report explained. Despite that assessment, giant Anheuser-Busch InBev eked out a tiny ($95 million) gain in 2016 North American sales. That may be due to a small bump from the SABMiller acquisition (more on that later) and the success of Bud Light in Canada. Nestle SA’s North American businesses had good years. Nestle USA’s sales increased 3.2 percent and Canada’s went up 3.5 percent. At nearly $27 billion, the U.S. is the Swiss firm’s biggest single-country market. Nestle’s sales in Russia leapt 12 percent, although it remains the smallest market, at less than $1.4 billion. Sales in “Greater China Region,” Nestle’s second biggest market, fell 4.4 percent to $6.4 billion. But the biggest drop was in Nestle’s home country of Switzerland, where sales fell 4.8 percent to $1.45 billion. Some companies remain on predictable paths. In its third year of operation, Kraft Heinz sales declined for the third year. No one on the 31st floor of the PPG Building in Pittsburgh was alarmed, as income, stuck in the mid-$600 million for the first two years, shot up to $3.6 billion. All the cost-cutting and layoffs are paying off. Conagra continues to slim down. Sales neared $16 billion in fiscal 2015 (the company’s fiscal year ends around May 31 each year), but they’re half that now: $7.827 billion in the 2017 fiscal year ended May 31. Conagra has been mostly shedding brands since the disastrous 2012 acquisition of private label powerhouse Ralcorp. ConAgra with the capital A in the middle of its name paid $6.8 billion for Ralcorp but sold it to TreeHouse Foods three years later for $2.7 billion. Conagra also split off its frozen potato business into Lamb Weston, further reducing sales. But after a $667 million loss in FY2016, the company – born and bred in Omaha but now headquartered in Chicago – turned it around 100 percent to record a $648 million profit in FY17. The biggest sales gain on our chart belongs to Molson Coors Co. – although it’s a little misleading. Molson and Coors hooked up in 2005, three years after Miller Brewing was acquired by South African Breweries (SAB). To better combat Anheuser-Busch on its home turf, Molson and SAB lent Coors and Miller to a joint U.S. sales venture, and that’s where we’ve recorded their sales since the 2008 marriage. But for AB-InBev to acquire SAB late last year, antitrust concerns required not just the end of the MillerCoors joint venture but the sale of Miller to someone … and Molson Coors stepped up. Ergo the $10 billion bump in sales. Also moving in the wrong direction is Cal-Maine Foods. Even with the benefit of a 53-week fiscal year, the egg company’s 2016-2017 sales plummeted, from $1.909 billion last year (its fiscal 2016) to $1.075 billion this year (its 2017 fiscal year just ended this June 3). The company recorded a net loss of $74 million compared to a profit of $316 million last year. “Our results … reflect the volatile and challenging egg market fundamentals that have prevailed throughout this fiscal year,” said Dolph Baker, chairman and president/CEO. Next to energy prices, food is one of the most volatile categories of the consumer price index. Not only did egg prices plummet over the past year, beef prices declined, as Tyson said a few paragraphs earlier. As the spokesman for another meat company noted, explaining his company’s decrease in sales: “The entire meat industry has been experiencing deflation.” After eggs, fresh vegetables were seeing the biggest price declines in the first quarter of this year. USDA’s Economic Research Service reports overall 2016 food-at-home prices decreased (-1.3 percent) for the first time in nearly 50 years. If you’re keeping the overall score, as we do, 39 companies reported sales increases of at least 2 percent in this table; 22 had similar declines. In net income, 31 had improvements, 22 deteriorated. But only four (add Cott Corp. to the previously mentioned TreeHouse, Post and Cal-Maine) had losses for the year. We should explain the figures in this table and report. 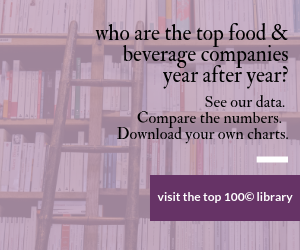 We rank companies based on value-added/consumer-ready (but not necessarily branded or in final form) foods and beverages that were manufactured in U.S. and Canadian plants. That’s tough enough to figure out for the public companies; for the private companies, we rely on their statements to us and other public reports about their finances or the general health of their business. That’s why PepsiCo’s figure is $39 billion, not the nearly $63 billion in global sales. Cargill appears as an $8.7 billion meat packer, not a $110 billion owner of ships and trains around the globe. ADM is not on the list at all. Monster Beverage Corp., even at nearly $3 billion in sales, is not on this list (the company manufactures none of its own beverages, all are done by copackers). We use the most recent fiscal year available; in most cases that’s calendar 2016, but we note the exceptions. Some 2017 fiscal years ended as recently as a few weeks ago. Unless the companies do the math for us, we convert euros, reals, pesos and Canadian dollars to U.S. dollars at the end of each company’s fiscal year or the rate on Dec. 31, 2016. As a result, you won’t find this list or these numbers anywhere else. They are unique to Food Processing.